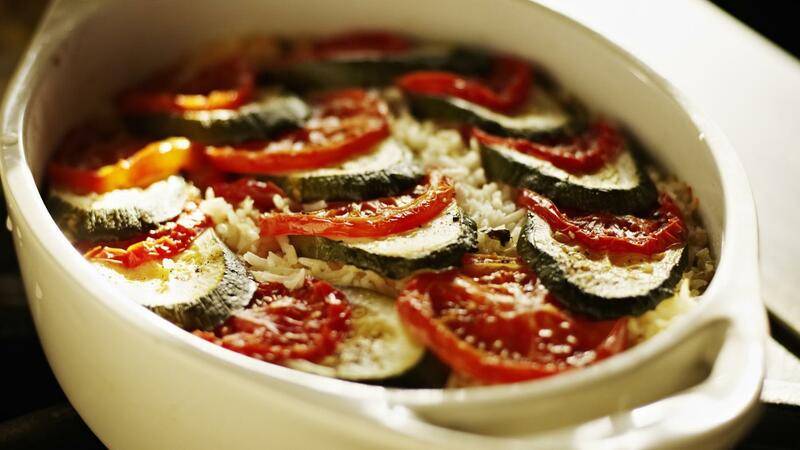 What Is an Easy Casserole Recipe? An easy casserole recipe is Paula Deen's green bean casserole, which uses green beans and cream of mushroom soup to make the casserole. The dish is topped with French-fried onion rings for added crunch. This recipe is ideal as a side dish or appetizer and has received five stars on average from reviewers. The Food Network considers it an easy-to-make recipe. It calls for a House seasoning that requires mixing together 1 cup of salt, 1/4 cup black pepper and 1/4 cup garlic powder. Cook the onions and mushrooms in melted butter inside of a skillet. Boil the green beans in the chicken broth for 10 minutes, and drain the broth. Pour the green beans, soup, onion rings, and seasoning into the onion and mushroom mixture. Stir it together and place it in baking dish to cook in the oven for 20 minutes. Sprinkle the cheese on top of the casserole and cook it for 10 minutes. What Is a Good Tuna Noodle Casserole Recipe? What Is a Good Homemade Tuna Casserole Recipe? What Is a Quick, Easy Recipe for Tuna Casserole? What Is an Easy Hamburger Casserole Recipe? What Temperature Do You Cook Frozen French Fries? How Long Does It Take Gnocchi to Cook? What Is a Recipe for Self-Rising Cornmeal? How Is Math Used in Cooking? What Is a Good Recipe Using Cream of Mushroom Soup? What Is a Good Cheesy Hashbrown Casserole Recipe? What Is a Simple Broccoli Casserole Recipe?